So today at the office, I had one of those fabulous moments of “grace in motion”. I was moving a box of copy paper by pushing it with both of my hands, bent down, as it was too heavy to lift. Can you picture this? As I was so gracefully and vigorously pushing this box into a space under the counter, I forgot all about the counter edge that would meet my forehead first …..BAM! OUCH!! Literally, I was so stunned that nothing came out of my mouth, not even a curse. 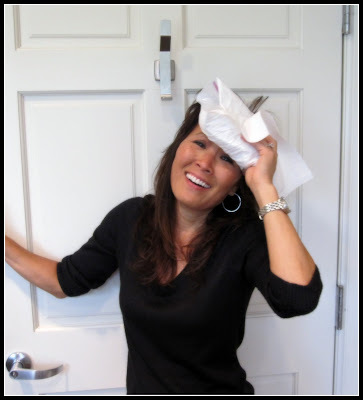 Of course, as I was walking around the office with a bag of ice on my forehead, my husband thought it would be a funny topic for a post. “Not so gracefully 50” he says…..haha. Few pics he took of me today…. You just gotta laugh sometimes….